Senior Mihaela Kosi dominated the field at Heavenly Mountain Resort on Sunday, Jan. 28, claiming first place in both of her races. The Sierra Nevada College alpine ski team rang up four, first-place finishes during the weekend, putting together a dominant performance on the slopes at Heavenly Mountain Resort. 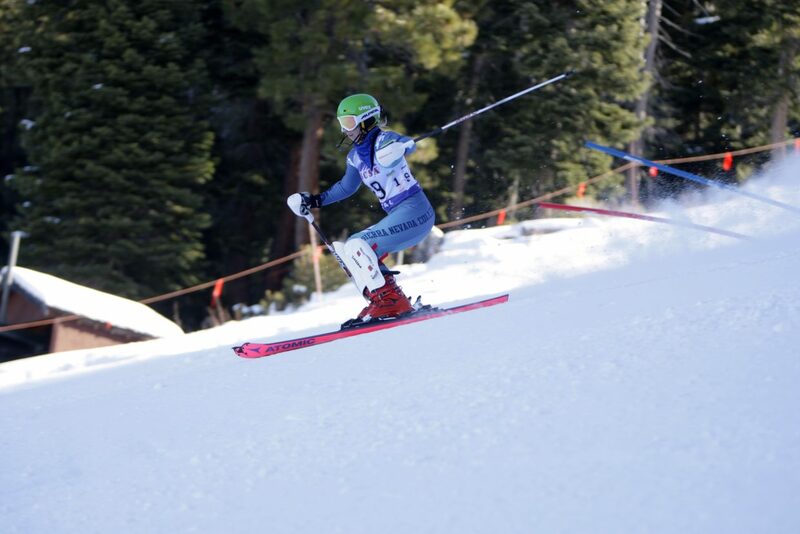 Racing began on Saturday, Jan. 27, on Heavenly’s World Cup run with a round of slalom racing between Sierra Nevada College and four other colleges. Freshman Adrian Rhomberg took first place on the men’s side for the Eagles, finishing with the day’s two fastest runs for a total of 1 minute, 8.36 seconds. Teammate and fellow freshman Vidar Widing finished second with a total time of 1:0.64. On the women’s side, senior Mihaela Kosi started off a terrific weekend on the snow with a two-run time of 1:2.39 for a first-place finish. Junior Eva Jazbec was next for the Eagles with a total time of 1:13.05. Freshman Emma Strenvall (1:13.44) and senior Caroline Sanden (1:15.31) were the next two to finish, giving the Sierra Nevada College girls the four fastest times of the day. Racing continued the next day during a warm and sunny Sunday morning at Heavenly with another round of slalom. Kosi came out on fire, finishing more than a second faster than second place with an opening run time of 30.86. The 24-year-old continued that momentum into her second run and again finished more than a second faster than any other woman, claiming first place with a total time of 1:00.98. “She has no regard for the gates,” remarked a race official as Kosi blasted past the midway point of the course on her final run for a time of 30.12. Eagles junior Saana Ahonen came in second with a total time of 1:03.60. Jazbec (1:04.35), and Strenvall (1:09.40) were the next two fastest skiers as the Eagles women again took the top four fastest times of the day. On the men’s side, Widing claimed first place with the day’s two fastest runs for a total time of 58.26. Sierra Nevada College Sophomore Luka Gobec finished second with a total time of 59.61. The Eagles will be back in action on Saturday, Feb. 3, at Squaw Valley for two more days of United States Collegiate Ski and Snowboard Association racing. The Sierra Nevada College men and women have won every conference race thus far.